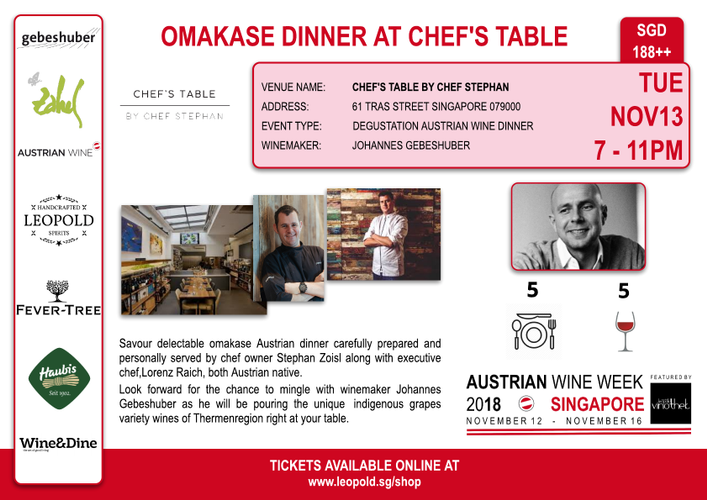 Rated as one of the top restaurant in singapore with no fixed menu, Austrian Wine Week retain its collaboration with Chef’s table by Chef Stephan on day 2, 13th November. Entice palate with an Austrian omakase five-course wine pairing dinner specially curated and served personally by owner chef Stephan Zoisl and Executive chef Lorenz Raich, both Austrian native. Johannes Gebeshuber from the Thermenregion of Austria and has his focused and presence in Asia market for a long period of time will be present to showcase his wine. get the chance to understand more on his specialty for producing the ingenuous white grape varietals of Austria, rotgipfler and zierfandler.